As a government affairs specialist I am afforded many fantastic autograph opportunities that I never take for granted. Whether it be an in person encounter or I obtain a desired signature through the help of a top government official – I am always grateful. Sometimes it is not my vocation that helps me but just plain old fashion planning and positive thoughts that produce incredible results. Back in the early 1990’s I began documenting my encounters with historical figures by having them autograph baseballs for me. My passion for collecting autographs has only increased as the years have gone on but now I focus my energy on just getting signatures from heads of state – past, present and future. I find this the most challenging and at the same time the most rewarding. In today’s world it is increasingly difficult to obtain an in person signature from a world leader. On a recent trip to Washington, D.C., I was focused on obtaining one signature and one signature alone while I was in town. That was the current President of Afghanistan – Hamid Karzai – who was in town for talks with President Obama, Secretary of State Clinton and members of the Senate Foreign Relations Committee. I knew it would be a major challenge not only to get President Karzai to sign a baseball for me but just to be anywhere near his presence and delegation. Well I could not have planned my mission any better as I ended up having dinner at the right restaurant that night! As we were walking into the restaurant – I saw a few State Department security officials mulling about. Then I saw a security officer from the Afghanistan delegation – who was escorting and protecting the Foreign Minister from Afghanistan that night. I approached him and introduced myself while I told him about my collection which was exhibited at the Gerald R. Ford Presidential Library and Museum in Grand Rapids, Michigan back in 2008. I asked him for his help in procuring Mr. Karzai’s signature on my baseball. He said he would absolutely get it done for me and he would personally bring the baseball back to my hotel in a few days. I was very excited just at the thought of maybe adding President Karzai’s signature to my collection of baseballs from world leaders. He took a baseball from me and my business card. Ten minutes later as we were seated in the restaurant – the same security officer escorted the Foreign Minister and his guest to the table right across from us. He said hello to me and mentioned again that he would see me later in the week. I thanked him. Almost an hour later as we were preparing to pay the bill and leave the restaurant – the security official quietly approached my table and presented me with the baseball signed by President Hamid Karzai, who was staying at the adjacent hotel. He remarked to me that the President’s motorcade had arrived back a couple of hours earlier than he had thought it would and he was able to greet the President and have him sign the baseball as he exited his car at the hotel. 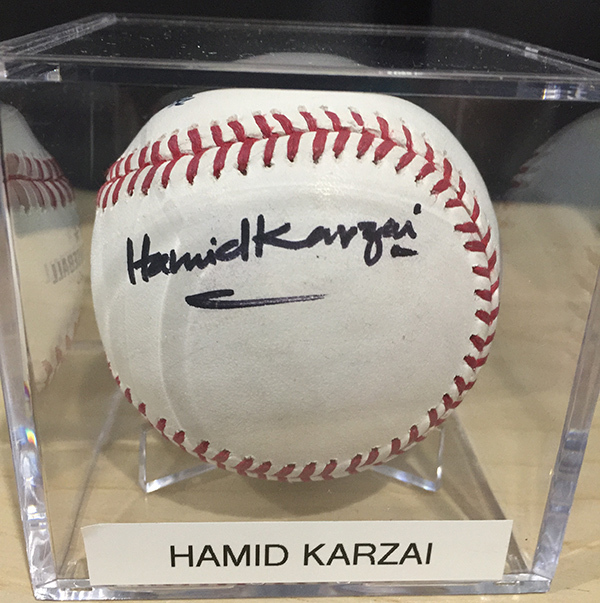 I thanked him and could not believe that I finally had gotten Mr. Karzai’s signature on a baseball! The only downside – I never ask for personalization because all of my baseballs are signed with just the signature of that individual and I like them to all be signed in the same fashion. Oh well – I did not even think to ask him to have the President just write his name and not personalize it to me.